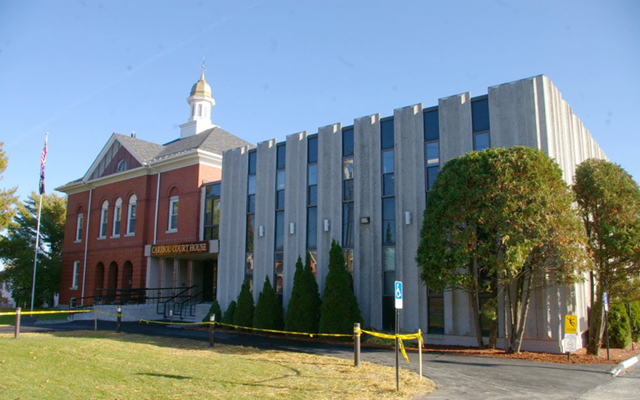 The following cases were heard under the Aroostook Criminal Docket at the Caribou Courthouse during September 2018. CARIBOU, Maine — The following cases were heard under the Aroostook Criminal Docket at the Caribou Courthouse during September 2018. Troy L. Hammond, 53, Wade: selling liquor without license, $500 fine. Jessie A. Case, 33, Mars Hill: unlawful trafficking in scheduled drugs, 31 days in jail, probation partially revoked, probation continued. David Charles Rowland, 26, Westfield: probation violation, 48 hours in jail, probation partially revoked. Meagan M. Adams, 34, Caribou: assault, $300 fine. Chad Peterson, 27, Caribou: probation violation, 146 days in jail, probation revoked. Joshua J. Clark, 25, Presque Isle: probation violation, probation partially revoked, probation continued. John R. Cross Jr., 39, Limestone: OUI (alcohol), $500 fine, 150-day license suspension. Jessica L. Brown, 36, Caribou: theft by unauthorized taking or transfer, priors, $29 restitution; violating condition of release, dismissed. Adam Guerrette, 28, Caribou: violating condition of release, 10 days in jail; burglary of a motor vehicle (four counts), 30 days in jail (each); theft by unauthorized taking or transfer (three counts), dismissed (each); refusing to submit to arrest or detention, refusing to stop, 30 days in jail. Ethan Rossignol, 28, Woodland: driving to endanger, $575 fine, 30-day license suspension. Chad A. Little, 25, Caribou: unlawful possession of scheduled drug, $500 fine, 10 days in jail. Autumn Parady, 21, Fort Fairfield: unlawful trafficking in scheduled drugs, dismissed. April L. Monroe, 32, Caribou: theft by deception, $100 fine. Todd W. Cochran, 46, Caribou: operating while license suspended or revoked, prior, $500 fine. Chris Brescia, 41, Caribou: violating protection from abuse order, $500 fine, seven days in jail; criminal threatening, seven days in jail; disorderly conduct, offensive words, gestures, seven days in jail. Samuel J. Belanger, 23, Caribou: operating while license suspended or revoked, $500 fine; attaching false plates, $250 fine; violating condition of release, $250 fine. Heather Bingaman Cochran, 39, Caribou: operating while license suspended or revoked, $250 fine. Jody Dudley, 48, Caribou: OUI (alcohol)-no test, $600 fine, 96 hours in jail, 150-day license suspension; operating while license suspended or revoked, $250 fine. Merle Derry, 25, Caribou: domestic violence terrorizing, dismissed. Craig Johndro, 42, Limestone: OUI (alcohol), $500 fine, 48 hours in jail, 150-day license suspension. Samuel J. Belanger, 23, Caribou: operating while license suspended or revoked, prior, $1,000 fine; violating condition of release, $500 fine. Jonathan Emmert, 21, South Portland: burglary, dismissed; criminal trespass, four months four days in jail; refusing to submit to arrest or detention, refusing to stop, four months four days in jail; unlawful trafficking in scheduled drugs, dismissed. Jeffrey Chestnut, 51, Caribou: operating a vehicle without license, filed on $100 costs. Gregory C. Adams ll, 30, Presque Isle: operating while license suspended or revoked, prior, $500 fine. Matthew Martin Beil, 23, Presque Isle: operating while license suspended or revoked, $250 fine. Amy Theriault, 37, Caribou: violating condition of release, three days in jail. Jana Haney, 39, Caribou: failing to register vehicle, $100 fine. Abbie Levesque, 31, Ashland: violating condition of release, seven days in jail. Dale J. Morin, 61, Caribou: fishing violation of number, amount, weight or size, $140 fine. Karen Carmichael, 55, Washburn: failing to register vehicle, dismissed. Sabrina Adams, 40, Caribou: failing to register vehicle, dismissed. Reece McDougall, 20, Caribou: motor vehicle speeding 30-plus mph over speed limit, dismissed. John Pelletier, 86, Caribou: failing to notify of motor vehicle accident, $200 fine. Benjamin M. Phippen, 27, Brewer: operating while license suspended or revoked, $750 fine; violating condition of release, $250 fine. Cody Morin, 24, Mars Hill: unlawful use of bait in artificial-lure-only water, $100 fine. Jamie L. Seeley, 47, Caribou: criminal trespass, 48 hours in jail. Rossignol Sanitation, Caribou: commercial trash hauling without license, $100 fine.